"Lal Bagh", this is a well known, word, Botanical Garden for all the people in southern INDIA, Bangalore, (of-course in entire INDIA). This is also called "The Red Garden", in English. This garden was given a status of Government Botanical Garden since 1856 and since then, it has been an internationally renowned centre for scientific study of plants and botanical artwork and also conservation of plants. 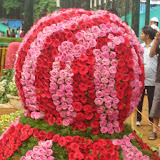 The special occasions here are REPUBLIC DAY (Jan 26th) and INDEPENDENCE DAY (Aug 15th) where the flower shows are conducted and is one of the most awaited events in the garden city (Bangalore). To know more click on "LAL BAGH ATTRACTIONS - 2013". I have visited this place, LAL BAGH, on last Sunday 11th of Aug'2013 and this is my fourth consecutive year visited successfully. Those of you who cannot visit this place before next Sunday, 18th Aug' 2013, do not disappoint and undoubtedly here is what you can see there. These pic's are taken from, my costliest buy in 2004, ">Sony Cybershot Camera 5.1 mega pixel (Rs.12,500). I am sharing this because you are my asset. Thank you and HAPPY INDEPENDENCE DAY to you all.